Let’s face it. Your factory headlights are plain, boring, and begging to be replaced. You see some of these new cars with brilliant looking projector headlights. You wonder why your truck came with the basic run of the mill headlights you ended up with. This is where RECON comes to the rescue. Recon Projector headlights will make your vehicle stand out from the crowd. 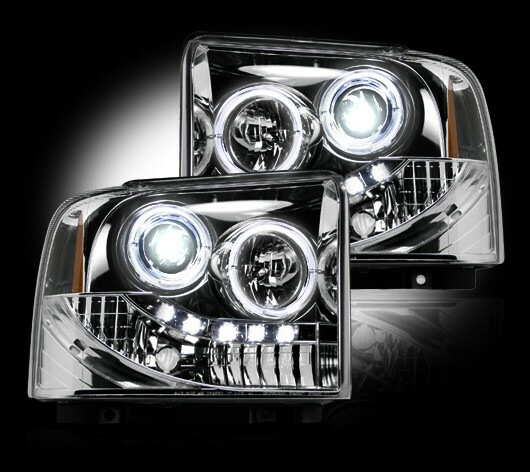 RECON’s Projector Headlights were designed by the engineers at RECON, who are truck enthusiasts themselves. They know what your factory headlight assemblies are lacking, and they’ve come up with unique solutions that give a luxuriously sporty look, and set your vehicle apart from the rest of the pack. RECON Projector Headlights are 50 state street legal and manufactured to the highest standards, meaning that you won’t be sacrificing durability or functionality when running your RECON Projection Headlights. 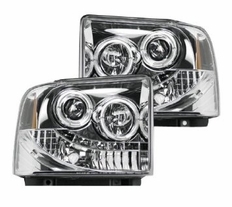 The part number for these RECON Projector Headlights is 264193cl and they fit 2005-2007 Ford Superduty F250/F350/F450/F550 models. We Guarantee the lowest out the door price on RECON Lighting Products. If you find the same RECON Light part number for sale somewhere else for a lower out the door price, we will match or beat the price. Keep in mind that our shipping is free when comparing prices and we keep an extensive stock. Most RECON items ship the same business day you buy them! Simply give us a call at 866-639-5385 during regular business hours and direct us to where we can see the better RECON Lighting price. We think our prices on our RECON Lights are very competitive, but if you think you've found a better deal, we want to know!